There's nothing quite like a steaming hot cup of tea on a cool winter morning. 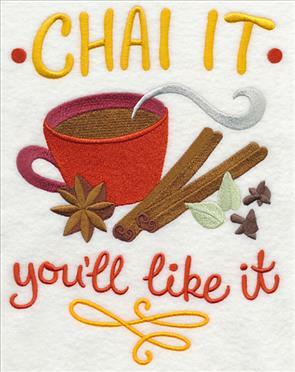 This week's new designs are the perfect way to celebrate your favorite hot beverage! 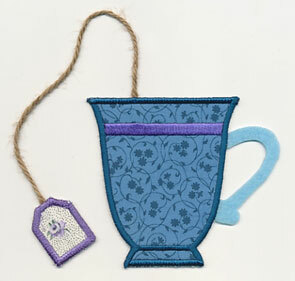 New samplers add a colorful and eye-catching look to tea cozies, and placemats. 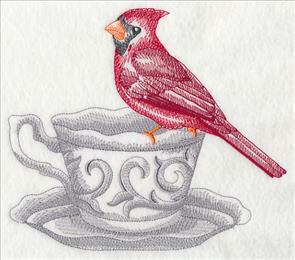 Baby animals in teacups are sweet on kids' gear, while toile tea party designs are elegant on tea towels and tote bags. 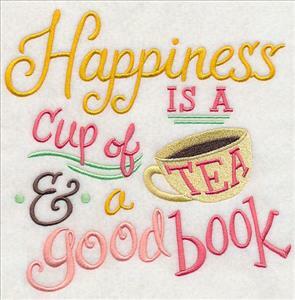 Plus, new applique, lace, and on-the-edge designs (and a new in-the-hoop bookmark) let your creativi-tea shine! 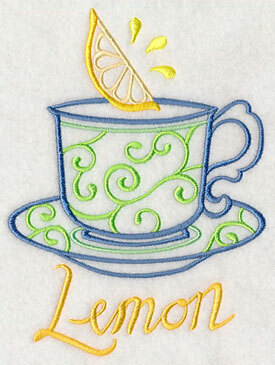 Keep your tea water nice and hot with an embroidered tea cozy! Get the free tutorial for this project here. 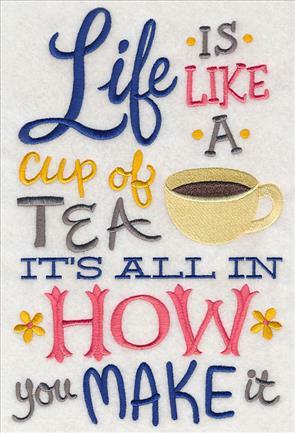 Show off your love for tea with sweet quotes and sayings that celebrate the warm and cozy drink. 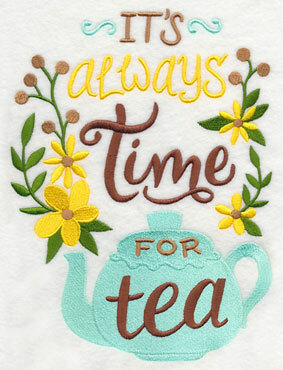 "It's Always Time for Tea" is a terrific addition to tea cozies and wall hangings; tell someone they're your cup of tea on towels and mug (or cup!) rugs. 6.91" x 9.26" and 5.83" x 7.81"
6.91" x 8.93" and 5.86" x 7.57"
4.86" x 6.28" and 2.99" x 3.86"
Each of these sweet samplers use bright colors, eye-catching fonts, and fun accents to bring interest and appeal to your embroidery projects. 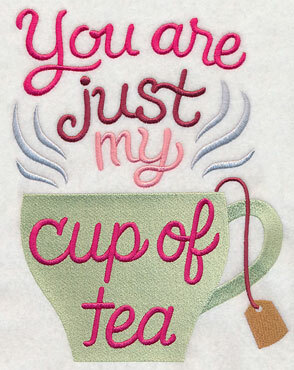 Plus, they're all a fabulous way to celebrate your love for tea! 6.91" x 10.13" and 5.86" x 8.59"
5.33" x 7.82" and 4.68" x 6.87"
6.91" x 10.61" and 5.86" x 9.00"
5.09" x 7.81" and 4.47" x 6.86"
Get the par-tea started in your craft room by whipping up a tote bag, apron, or tea towel with one of these punny designs. They're sure to add color and whimsy to your kitchen decor. 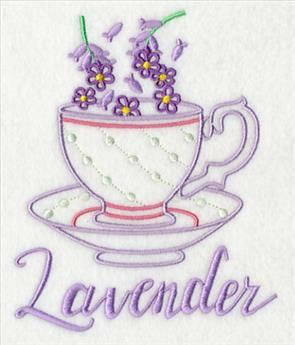 6.91" x 9.69" and 5.56" x 7.81"
These tea samplers are a fabulous fit on tea towels, and are sure to bring color and pizzazz to your kitchen. 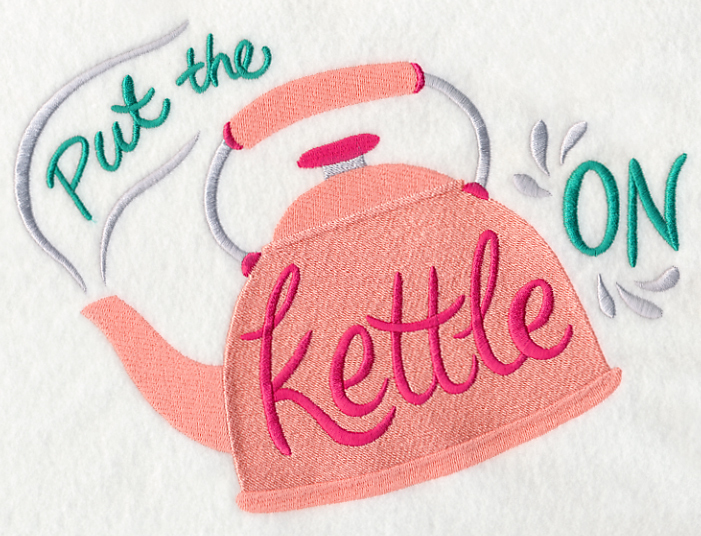 Get our best tips for embroidering on tea towels in this free tutorial. 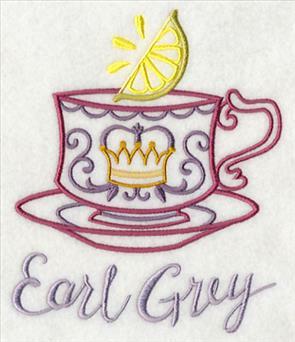 Whether you're a black tea purist or love to try all the flavors, you'll fall for these charming tea designs! 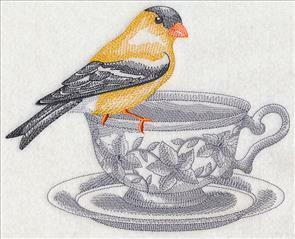 They're lively on shirts, totes, and framed art to brighten up your favorite place to sip on a cuppa tea. 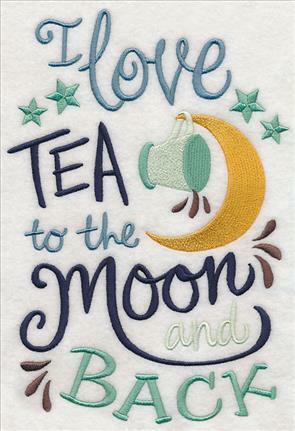 7.82" x 7.66" and 6.99" x 6.85"
5.98" x 5.86" and 4.95" x 4.85"
These brilliant sayings and samplers are a striking way to stitch your love for tea. Add to wall hangings, framed pieces, and mini-quilts to dress up your everyday decor. 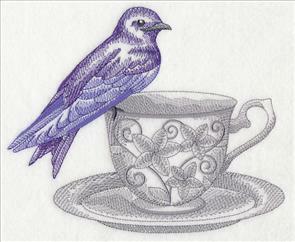 9.42" x 6.90" and 7.82" x 5.73" and 6.64" x 4.87" and 3.87" x 2.84"
Stunning lifelike birds perch on ornate teacups in this toile tea party. 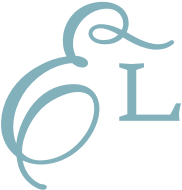 The light style of toile designs make them particularly gorgeous when stitched on smooth, low-nap fabrics, such as linen, denim, canvas, or twill. 8.68" x 6.90" and 7.36" x 5.85"
7.80" x 6.81" and 6.69" x 5.84"
5.54" x 4.84" and 3.85" x 3.36"
The contrast between the colorful birds and muted, sketch-style teacups is a stunning addition to a wide variety of projects. 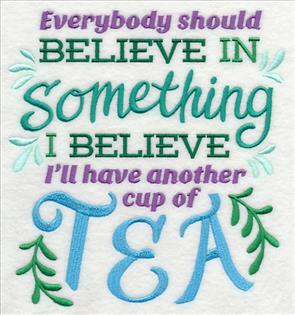 We love them on tea towels, tote bags, pillows, and more! 7.80" x 6.42" and 7.10" x 5.84"
7.31" x 6.90" and 6.20" x 5.85"
5.13" x 4.85" and 3.85" x 3.63"
Cute and adorable animals peek and play in whimsical teacups! 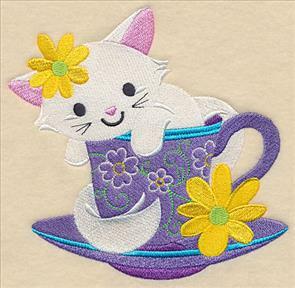 Bright colors and detail give the cups eye-catching interest; baby animals are a sweet addition to these designs. 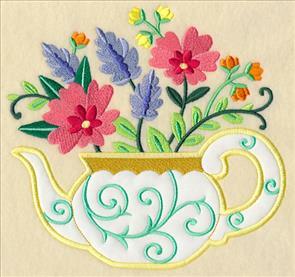 5.85" x 7.61" and 4.83" x 6.28" and 2.97" x 3.85"
Floral accents give the teacup designs even more charming appeal. 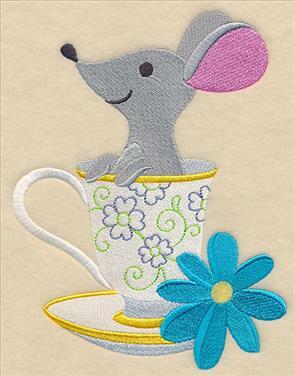 Stitch on kids' gear, or use to adorn your own tea cozies, sweatshirts, or towels. 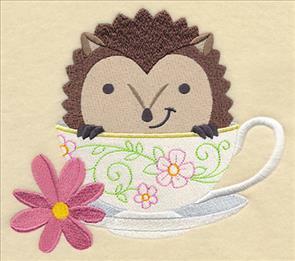 6.06" x 5.86" and 5.01" x 4.85" and 3.85" x 3.73"
Here a chick and a hedgehog play inside their colorful cups. 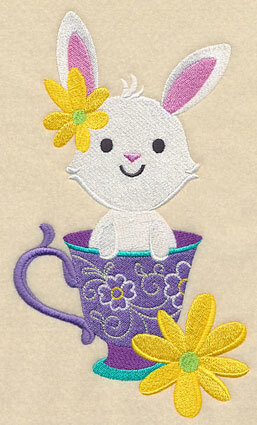 Pick your favorite animal to stitch alone, or use them all for a fun and fabulous combination! 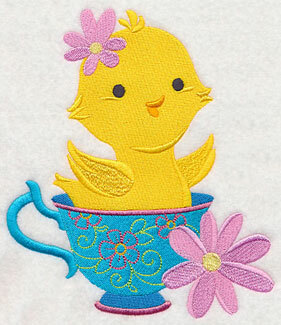 6.74" x 5.89" and 5.61" x 4.90" and 3.82" x 3.34"
These too-cute designs are fabulous for quilts, totes, and more! Purchase the designs individually by clicking the links above, or get them all in a pack. 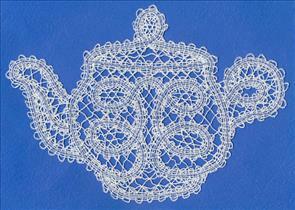 A lace teapot and teacup are elegant, classic additions to your home decor. 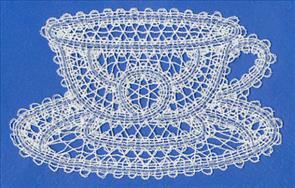 They've been stitched in the style of Battenburg lace, which uses cotton thread to replicate a hand-crocheted look. 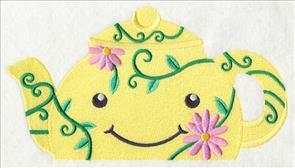 Find special instructions for embroidering these designs right here. 9.35" x 6.64" and 7.79" x 5.53"
6.90" x 4.31" and 5.75" x 3.59"
5.06" x 3.16" and 2.85" x 1.79"
Beautiful filigree detail and stunning gold thread give these teapot and teacup designs a majestic, exquisite appeal. 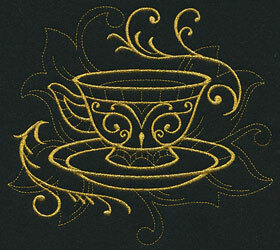 Stitch them on dark fabrics for a wonderful contrast, or use light colors for a tone-on-tone look. 7.78" x 6.60" and 6.91" x 5.86"
6.61" x 5.91" and 5.87" x 5.25"
4.84" x 4.33" and 3.85" x 3.44"
Every tea lover has their favorite type to drink, and these flavors will satisfy all preferences. 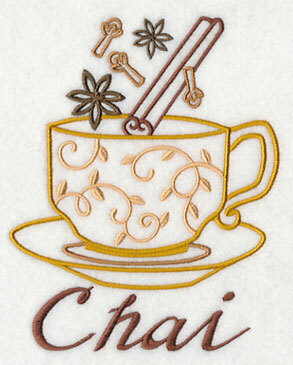 Whether you're a fan of lemon or chai, you won't be able to resist these charming tea designs. 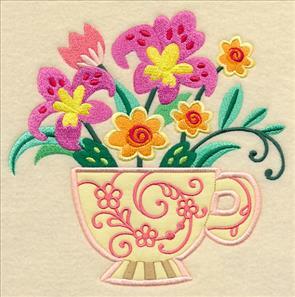 4.85" x 6.09" and 3.10" x 3.89"
Each of the various flavors and corresponding teacups have been stitched in the classic vintage style, which means they're delightfully quick to stitch (and cute to boot!). 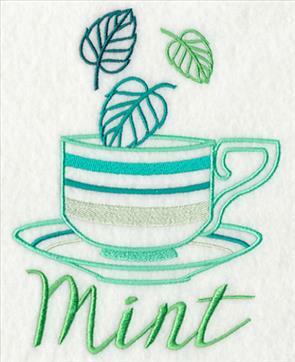 Pick your favorite type of tea, and add to tea towels, aprons, or tea cozies! 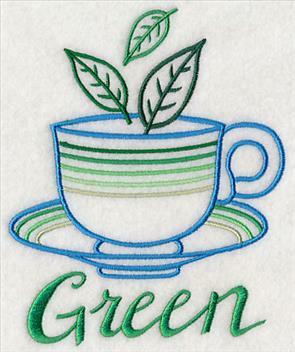 4.84" x 6.28" and 3.00" x 3.89"
Because vintage-style designs have lots of open areas that show through, we recommend stitching them on smooth, neutral fabrics, such as tea towels, linen, or canvas. Busy patterns and textures will compete with the beauty of the designs. 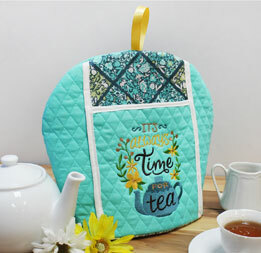 4.84" x 6.13" and 3.06" x 3.87"
With seven different tea flavor designs available, you can make a quilt for your favorite tea lover, or a set of Days of the Week designs, too! 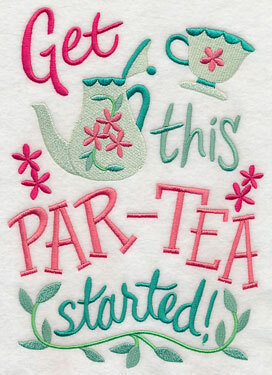 4.86" x 5.98" and 3.15" x 3.87"
Get all seven Taste for Tea designs in a pack. Two sizes are available to suit any project. 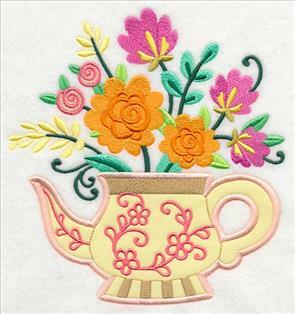 Beautiful blooms burst out of a teapot or teacup in these gorgeous applique designs. We love how applique combines fabric with embroidery (get our best tips in this tutorial, or watch the video here!). 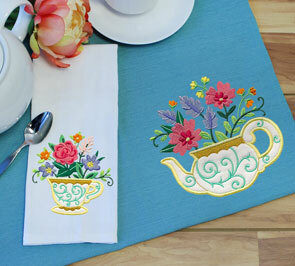 6.89" x 7.07" and 5.86" x 6.02" and 4.85" x 4.99"
Whip up a lovely set of dining linens with these floral applique designs! 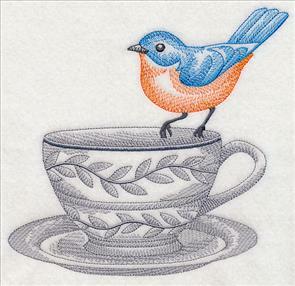 A matching placemat and tea towel, or even a tablecloth, mug rug, or apron are the perfect place for these designs to bloom. 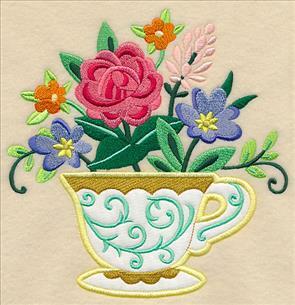 Add these floral designs to pillows, towels, table linens, and other embroidery projects. 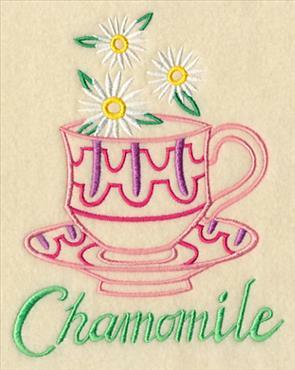 They're sure to be a big hit with tea and flower lovers alike! 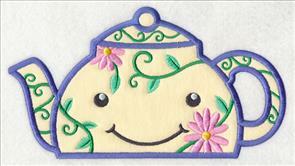 6.95" x 6.90" and 5.91" x 5.88" and 4.90" x 4.88"
This happy teapot and teacup are cute-as-a-button! 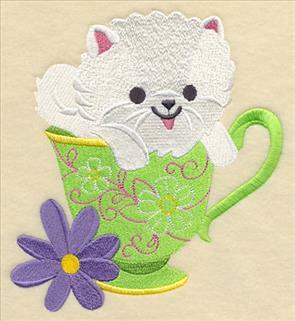 They've been specially digitized to be added to the bottom of projects, and are sweet additions to towels, hats, placemats, bibs, and more. 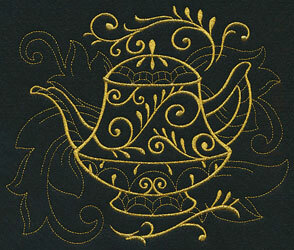 Plus, each comes in stitch-filled and applique versions to suit your project needs. 8.51" x 4.69" and 6.86" x 3.78" and 3.90" x 2.18"
Watch the free video to see our best tricks for using on-the-edge designs, or click here to see how we've added them to projects in the past! 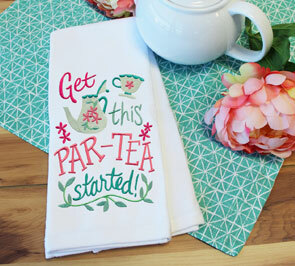 These peeking teatime designs are a sweet embellishment for kitchen and dining linens, too! 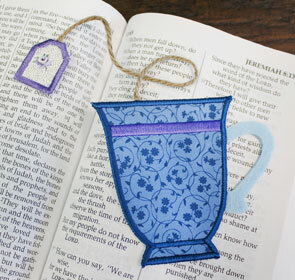 8.51" x 3.31" and 6.86" x 2.67" and 3.90" x 1.56"
Mark your place while reading with a teacup and tea bag bookmark! Simply slip the bookmark in wherever you've left off reading and let the string hang out to show your place. Click here for the free tutorial for this project. 3.83" x 3.49" and 3.44" x 3.14"
Pick your favorite fabric and colors to customize the lovely bookmark. 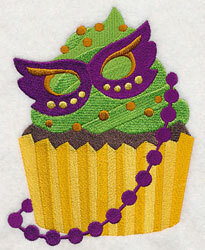 Diane requested Mardi Gras cupcakes to celebrate the tradition of Fat Tuesday. 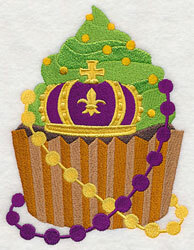 Each of these cupcakes feature a classic Mardi Gras accent -- a mask, a fleur de lis, and a crown -- plus strings of beads. 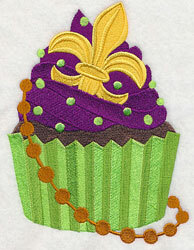 The traditional green, purple, and gold colors of the holiday offer even more of a Mardi Gras look. 4.83" x 6.29" and 2.96" x 3.85"